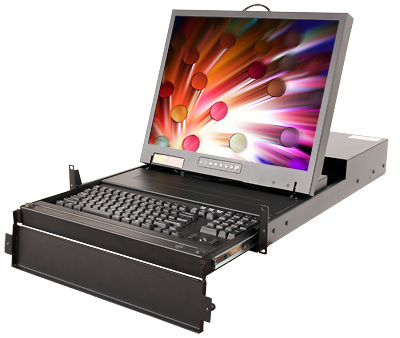 Vibrant LCD screens from 15.0" to 20.1"
The SlimLine Commercial Series LCD monitor, keyboard, pointing device (touch pad or trackball) is the perfect complement to General Digital’s other innovative, rack mount flip-up display products. Optimized for its ultra-low profile, the SlimLine Commercial is designed to save valuable rack space and expense by providing a reliable and user-friendly operator interface. The monitor’s compact design and industrial durability make it the ideal rack mount solution for network administration, telecommunications, mobile applications (transit case), and more. General Digital integrates the latest advances in LCD display technology including 15"–19" panels. All of our active matrix TFT LCD screens offer up to 16.7 million colors, wide viewing angles and fast response times (suitable for live video). All standard SlimLine Commercial rack mount LCD monitors support non-interlaced analog video (separate sync). Features include Auto Setup, Horizontal/Vertical Positioning, Phase and Fine Tune Adjustments, Color Control, Multiple Languages, and Image Expansion (features vary by model). The 1U and 2U high (1.75" and 3.50") rack mount enclosures are constructed from a combination of steel and aluminum, providing a cost-effective, lightweight housing that can be used in most commercial and light industrial applications. Use of continuous-friction hinges permits the display to be user adjusted over a usable range of more than 90°. 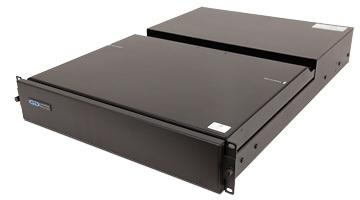 A pair of adjustable chassis slides facilitate rack mounting and ease of operation. Interface connectors for the keyboard, pointing device and input power are located on the rear of the device. 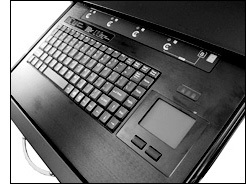 General Digital offers several commercial-grade keyboards and two types of pointing devices (touch pad and trackball) for integration into the SlimLine Commercial. 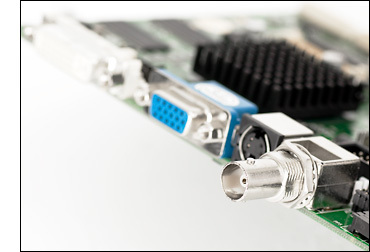 A limited number of options and accessories are offered in support of the SlimLine Commercial including: cable management systems, freestanding and rack mounted power supplies, keyboards/pointing devices, rack slides, video/serial/power cables and more. Please speak with a Sales Engineer or visit our Options and Accessories page for further details. General Digital encourages relationships with Original Equipment Manufacturers (OEMs) and other organizations, and is willing to maintain your company identity (private label) on our products. Please speak with a Sales Engineer for additional information. Below is an overview of typical General Digital SlimLine Commercial Series model numbers. Having a good understanding of the structure of our model numbers will help you configure your monitor. 1 Native Resolution is the fixed number of horizontal and vertical pixels arrayed in the viewable area of an LCD monitor. Refer to the LCD Video Controller table below for other resolutions that can be displayed. 2 Brightness and Contrast values are provided by the manufacturer of the LCD screen. 1 Most common video modes listed; other video modes supported. Please consult a Sales Engineer for more information. 2 Supports advanced features such as Live Video, Picture-in-Picture Windows (multiple user-selectable sizes) and Image Rotate. 1 Consult a Sales Engineer to select from a multitude of AC switching or DC–DC supplies that can be mounted within the customer’s rack. General Digital can assist in specifying a commercial, industrial or military power supply that will meet your specific requirements. 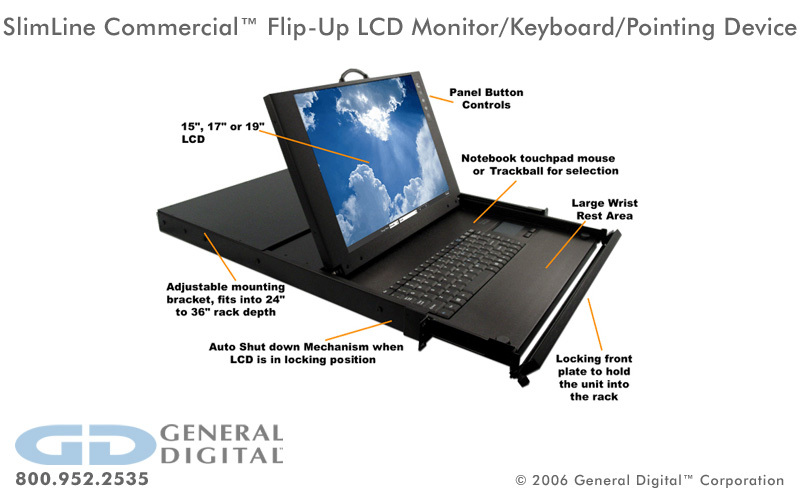 The photos below represent a small sampling of General Digital’s SlimLine Commercial LCD/keyboard products. They serve to illustrate the many display sizes and mechanical configurations we offer, as well as standard and custom design features, capabilities and options. Click the thumbnails to view full-size photos.